December 26, 2012 by rwb, under Blognote. This year is becoming one of the busiest year for me as I have many projects to handle (i.e. not related to the embedded system), as you know I always love to play with the electronic and embedded system although my professional job is not related to my hobby, but I always enjoy learning and exploring a new thing especially the embedded system and I hope you share the same passion as I did. During this year I finished the “Basic User’s Experiment Note” e-book project which is based on the 8-bit Atmel AVR ATmega328P microcontroller using AVRJazz 28PIN development board. This e-book covering most of the Atmel AVR ATmega328P microcontroller important features and it’s aimed for the beginner’s, hobbyist or anyone who wants to learn and understand the 8-bit Atmel AVR ATmega328P microcontroller powerful features. I am planning to create a second e-book project next year which is aimed to the intermediate readers where it will show how to interface to some of the popular electronic devices such as seven segment, LCD, I/O expansion, real time clock, motors, servo, and many more to the Atmel 8-bit AVR ATmega328P microcontroller. It’s been a wonderful year to be with you all the ermicroblog readers, thanks to all the ermicroblog readers for your support and encouragement, during this year. I do hope this blog could bring a better understanding of how we could make use of the electronic and microcontroller in our learning journey or just as hobby and fun. May this Christmas will bring joy and bless in your heart and good hope for this coming year. 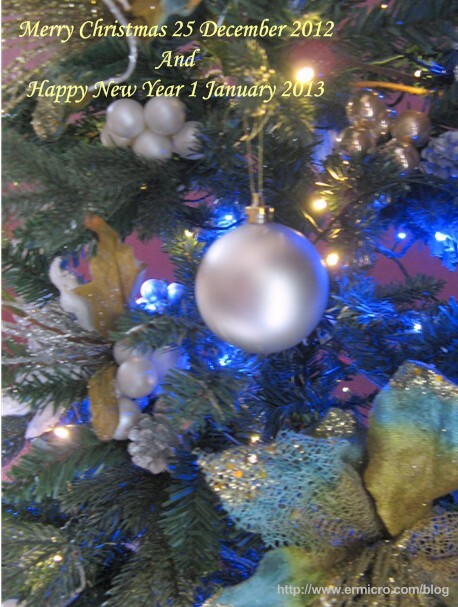 Merry Christmas 25 December 2012 and Happy New Year 1 January 2013. Have a fun and nice holiday may the Heavenly Father always bless you and your family.